A teenage boy with a loving mom and disgusting stepdad discovers that he is a demigod, and goes to Camp Half-Blood to train to fight monsters from "ancient" Greek myths. 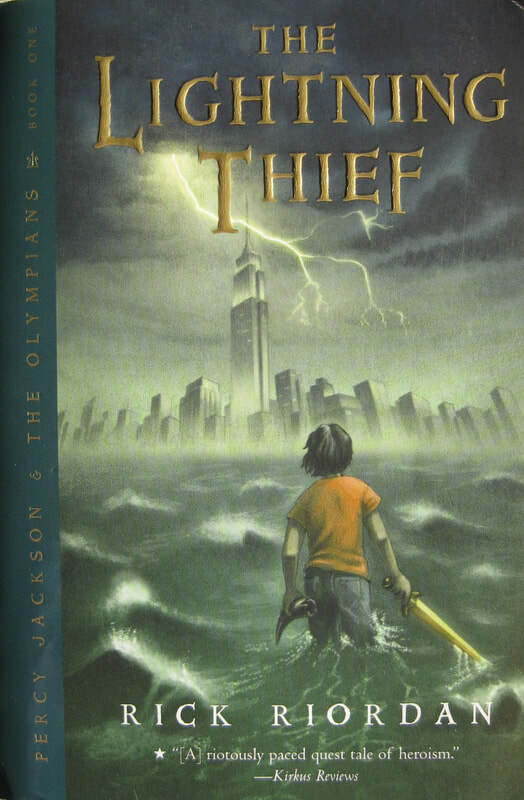 Percy Jackson is a modern New Yorker, but will that be enough to defeat the Minotaur? Or Clarisse, the aggressive daughter of Ares who hates his guts? The Heroes of Olympus series features a new trio of main characters, but also brings in some of the characters from this original series. The Trials of Apollo series also introduces new characters, but features appearances from some of the characters in this book. Fast-paced action and clever retorts will appeal to many readers, and fans of Greek myths will enjoy connecting well-known characters to this book's modern counterparts. This is one of the most compelling, can't-put-it-down kind of books in this genre. "Chapter One: I Accidentally Vaporize My Pre-Algebra Teacher."